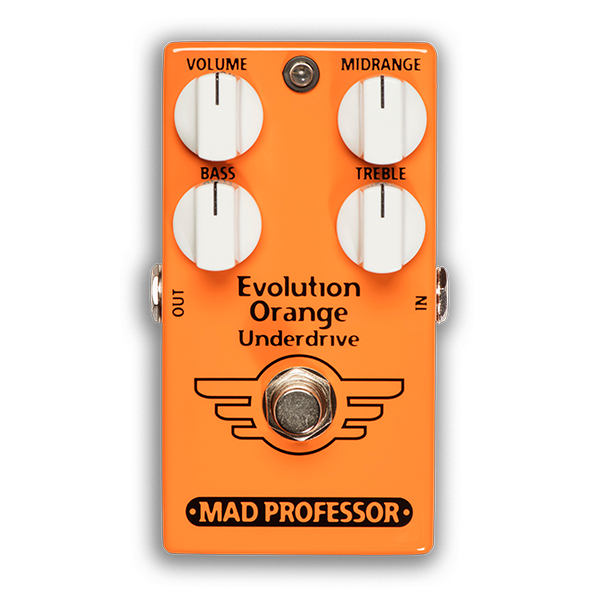 Evolution Orange Underdrive (EOU) offers a new way to approach your tone. Instead of overdriving your clean tone, now you can get cleaner tones from your favorite overdriven tone.That is what we call underdriving. With EOU you can tailor your cleaner tone with the four pots. The Evolution Orange Underdrive works by lowering the midrange as that is where the overdrive mostly is. You can dampen the amplifier input with the EOU’s Volume control and then set the Bass and Treble to tailor your clean tone. EOU can also be used to boost the mids by setting the Midrange and Volume up. CONTROLS MIDRANGE: ± 15 dB at 400Hz TREBLE: ± 15 dB at 7KHz BASS: ± 15 dB at 100Hz VOLUME: sets the overall volume level when the pedal is on ELECTRICAL SPECIFICATIONS Input impedance: approx. 500K Output impedance: approx. 5K Current draw: 10 mA at 9V Voltage supply range: +8V to +18V DC C A U T I O N ! Never operate the unit with its bottom removed or damage will most likely occur.